What grows nicely and looks good in our neighborhood? 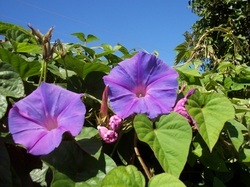 Most morning glory flowers unravel into full bloom in the early morning. They prefer full sun throughout the day. They can quickly spread by way of long, creeping stems and if not trimmed frequently can turn into a serious invasive problem. However, this glorious vine was first known in China for its medicinal uses, due to the laxative properties of its seeds. It was introduced to the Japanese in the 9th century, and they were the first to cultivate it as an ornamental flower. 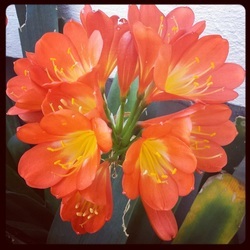 Today we can enjoy these vibrant flowers in California all year round. This happy looking bright flowering vine is native to Eastern Africa, and has been naturalized in other parts of the world. It is grown as an ornamental plant in gardens and in hanging baskets. 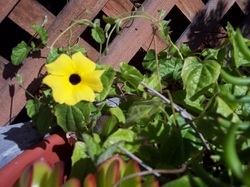 The name 'Black-eyed Susan' is thought to have come from a character that figures in many traditional ballads and songs. Thunbergia alata can grow to a height of 6–8 ft. tall and the flowers have five petals in a typically warm orange or yellow color with a dark purple center. Amaryllis is a small genus of flowering bulbs, with two species. The better known of the two, Amaryllis belladonna, is a native of the Western Cape region of South Africa. Amaryllis belladonna was introduced into cultivation at the beginning of the eighteenth century. It reproduces slowly by either bulb division or seeds and has gradually naturalized from plantings in urban and suburban areas throughout the lower elevations and coastal areas in much of the West Coast of the USA since these environments mimic their native South African habitat. Bougainvillea is a native plant from Brazil, Peru and South Argentina. It grows well in our Southern California climate.The vine species grow anywhere from 3 to 40 ft. tall, scrambling over other plants with their spiky thorns. The thorns are tipped with a black, waxy substance.They are evergreen where rainfalls occurs all year or deciduous if there is a dry season. The actual flower of the plant is small and generally white. Bougainvillea is sometimes referred to as "paper flower" because the bracts are thin and papery. Bougainvillea are relatively pest-free plants, but may suffer from worms, snails and aphids.